Hey nineties brats, do you remember the running man? You know what I’m talking about, that dance that’s a mixture of running in place and the moonwalk sans the motion? Well, that’s what I was doing when I received this from Warner. The running man. I thought I’d forgotten how to, but apparently not. 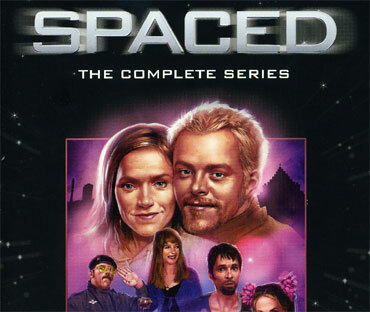 “Spaced” finally comes to DVD in the US bringing with it a slew of extras, and some of the funniest comedy in a sitcom that took many years to get to the states. The BBC and Warner simply don’t fail to give the fans what they’ve been begging for, with a reasonable price, and all the episodes in their uncut glory for the taking. I’ve seen the original episodes and I can safely say that nothing is cut from the episodes, and the entire series run keeps the mood and tone of the show in tact. Fans of American pop culture will love every single reference, homage, and pure satire of some of the greatest entertainment by the collective comedy wizards of Edgar Wright, Nick Frost, Nira Park, Simon Pegg, and Jessica Hynes (Stevenson), all of whom have achieved well deserved acclaim and fame in the states. The team of Nick Frost, Simon Pegg, and Jessica Stevenson haven’t been so well matched since the cast of “Seinfeld,” and the friends in real life bring a chemistry that is volatile on screen as they take every running gag and milk it for what it’s worth while never forgetting to create characters we can relate and connect with. If you love comedy, if loved “Shaun of the Dead” or just want to celebrate pop culture in all its offerings, be sure to get a hold of “Spaced: The Complete Series,” a DVD finally coming to the states that will not fail to entertain. It’s brilliant, absolutely brilliant. From “Evil Dead,” “X-Files,” and “Resident Evil” right down to “Murder, She Wrote,” not a single frame is wasted without a nod to a great movie or comic book, and the “Spaced” gang creates a brilliant cult sitcomedy that ended much too soon, and aren’t we lucky that it’s finally here in the US? You’ve heard all the raves from the fan boys, so why not have a simple top five for to get you started if you haven’t seen the series yet? Episode to Look for: Gone – It’s the night out episode with main characters Tim and Daisy who get in to trouble with a bunch of street toughs. Inspired by “After Hours,” it features quite possibly the best, funniest comedy sequences in the series, and in television history. Ever. And has a closing scene that never fails to send me in to hysterics. Best DVD Commentary: Kevin Smith – Though I’m not a fan of the man’s work, Smith works well off of the trio of Wright, Pegg, and Hynes trading barbs, interacting with the episodes, and being genuinely funny as a group. There are barely any dead air moments in the episodes with Kevin, which is the least I can say for the commentary with Patton Oswalt, and Bill Hader. Best Special Feature: I really doubt there’s going to be a feature more accessed than the Homage-a-Meter, because the creators take such pains in referencing movie after movie, and television show after television show that the average viewer may want to see what they missed. I am a huge pop culture junkie, and even I watched it. Twice! Slickest homage: It’d have to be the “Resident Evil” sequence in Art. Here is where you can see the creative seeds budding for “Shaun of the Dead,” and it all just seems so inevitable that the horror comedy would storm America and reach in to the hearts of fan boys everywhere making its stand as a bonafide masterpiece. Best Single episode Running Gag: Jar Jar Binks. That’s all I’ll say. Jar Jar Binks. This entry was posted in Collector's Den and tagged British, Comedy, edgar wright, Fanboy, Horror, pop culture, Romance, Science Fiction, simon pegg, TV Show. Bookmark the permalink.